Potato Sterz or in German "Kartoffel Sterz" is a dish that comes originally from Austria, and is very popular in Bavaria, especially in lower Bavaria. It is a simple dish that used to be the typical dish of the poor, and it can be made with different ingredients. Instead of potatoes you can use semolina, rye flour, buckwheat flour or polenta. The recipe originates from the lumberjacks in Kaernten or the Steiermark in Austria. Back then the lumberjacks, when they used to work in the woods for months, they only could take flour and lard as supplies. So the dish Potato Sterz was created. Happy Cooking! - boil potatoes and let cool off completely. Recommended is to boil them the day before. 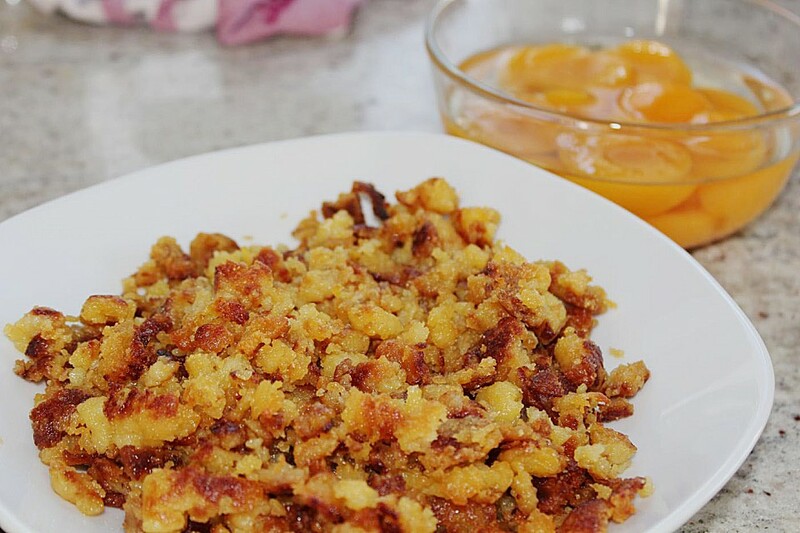 - peel potatoes and grate them, mix with flour and salt - you will get crumbles. - if the potatoes should not contain a lot of starch add some more flour. For this dish you need floury potatoes. - melt the oil, lard or clarified butter in a skillet and add the sterz slowly on lower heat. It should be nicely browned but not too much. Optional: Place the browned Sterz in a fire proof form, add heavy cream and bake on 350F until all the heavy cream had been absorbed. This last step makes the dish very rich. Serve with apple sauce, plum compote or any other compote. Some serve sour cream with it.